New York City's newest pedestrian-friendly maps will help encourage visitors and locals to choose walking as a better transit option. Photo by the NYC Department of Transportation. Hansel and Gretel may have had bread crumbs to lead their way, but New York City’s pedestrians will have something less edible to follow: Maps! Taking a page from London’s pedestrianization efforts, New York City’s Department of Transportation released a Request for Proposals (RFP) “to bring a comprehensive pedestrian information system to sidewalks in key New York neighborhoods,” according to a press release. The initiative is an effort to transform New York City’s streets into easily navigable and accessible public spaces for locals and tourists alike. 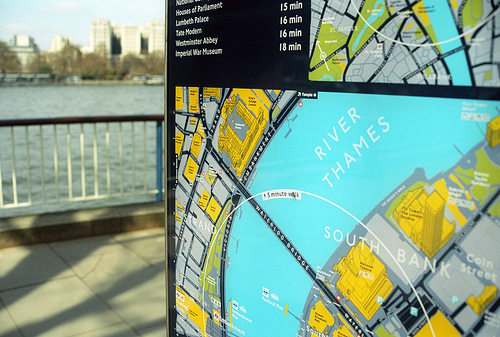 These so-called “wayfinding” maps and signs that comprise the initiative will serve as a coordinated pedestrian information network, allowing individuals to orient themselves, determine the distance to key destinations, and act as general direction-leading tools with easily read and recognized signs. We recently wrote about Transport for London’s “Legible London” maps that help guide on-foot travelers and commuters through the city’s streets. With impressive and exciting features like heads-on orientation, 5- and 15-minute walking circles, and 3-dimensional illustrated buildings, the Legible London maps speed up pedestrian journeys by 16 percent. Out of the 1,000 participants in the project’s pilot evaluation, 87 percent supported the integration of the maps across London. London's pedestrian maps indicate landmarks that are walkable by including them in 5-minute walking circles. Photo by rbrwr. Similar to TfL’s maps, the New York City maps will also feature concentric circles that represent approximate walking times, according to an article in The New York Times. However, the author also sees map-less navigation as a badge of honor: “a true city citizenship,” if you will. But with 1 in 10 New Yorkers admitting to having been lost in the past week, perhaps the maps are too late on the scene. As helpful as the maps may be in helping you get to the Empire State Building, they won’t give you all the information you need to survive in the city, argues the City Room blog. “[The maps] won’t tell you that Grand Army Plaza is a pedestrian nightmare, or that the cat outside the bodega at the end of the block does not like to be petted, or that the Starbucks on the left side of the street has surlier baristas than the one on the right,” quips the author. 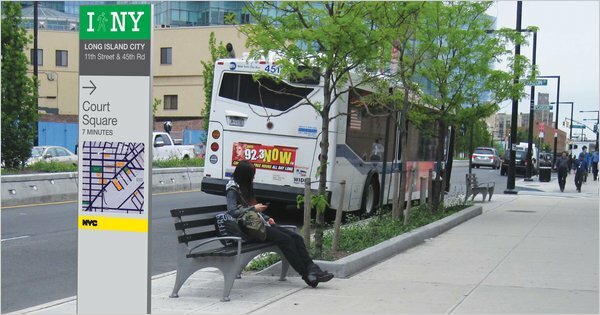 Currently, the RFP is focused on improving signage in Long Island City, Queens; Prospect Heights/Crown Heights, Brooklyn; and Chinatown, in addition to parts of Midtown Manhattan. What do you think? What makes a city easy for pedestrians to navigate? Zebras, Puffins, Pelicans or Hawks for Pedestrians?